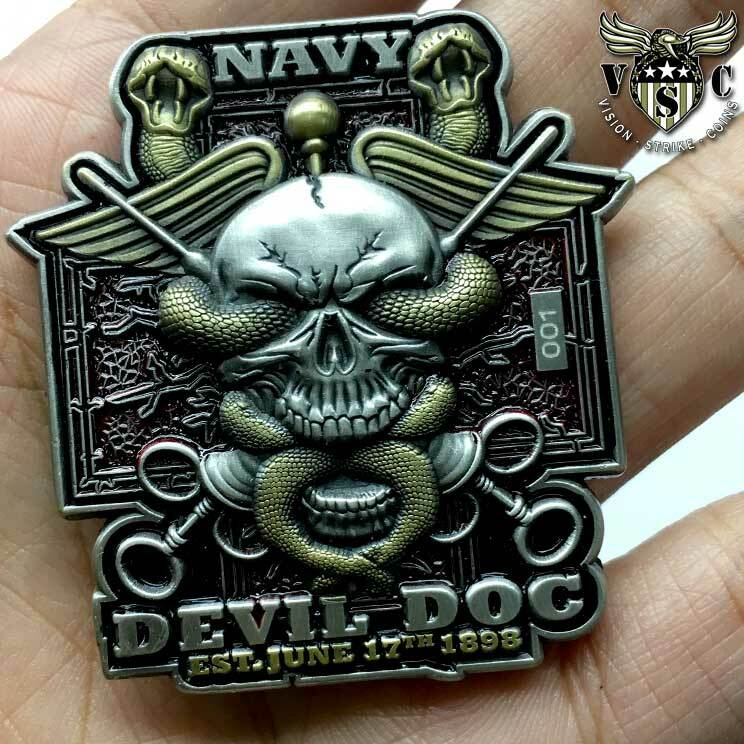 Navy Challenge Coins has been a central part of the US Navy for decades because they bring history and heritage in a metallic message in con form. The United States Navy and its Sailors have been creating and collecting coins for more than several decades. The level of complexity has clearly changed over this time. The style, metal types, detail and the nature of the metals has changed as has the level of collecting that has come with it. 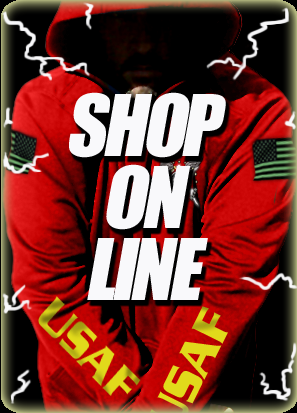 These US Navy Rate Coins Crafted For United States Sailors were designed by Vision-Strike-Coins.Com for US Navy Sailors both active duty, US Navy Veterans and Prior Service. They expect the best and that is why these coins have become so popular among their ranks. One of the earliest US Navy coins created by Vision-Strike-Coins.Com that gained tremendous popularity due to its detail, size and thickness measuring in at 4mm which was at the time far thicker a coin than many would have felt normal but was later received as exceptional and became the standard in the military coin industry. 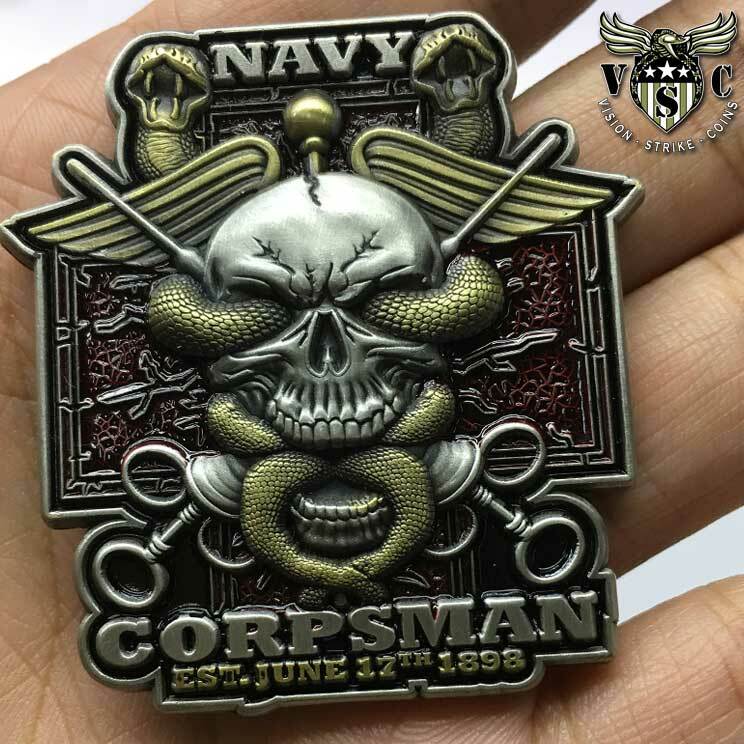 Dual metal types with antique gold and silver and red hand painted accents make these US Navy Corpsman coins among the best in the industry. 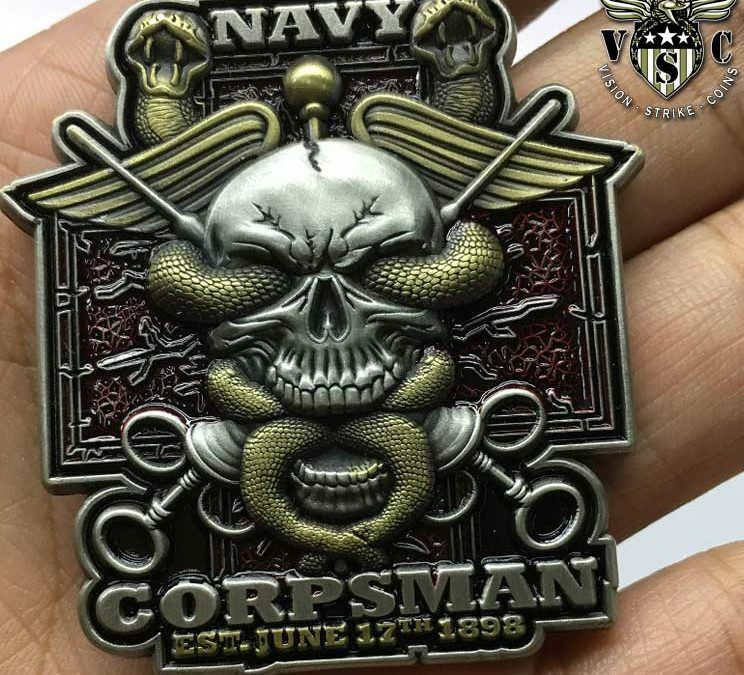 2 inches in diameter with different military art displayed on each side with Side A displaying the Navy Corpsman Text and Corpsman birthday of June 17th, 1898. Side B has the similar skull, crossed syringes and medical caduceus and words Devil Doc showing the nature of the FMF Corpsman as well. This is a limited edition military coin that was created for the United States Navy.